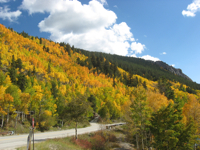 We usually wait until early October for our big scenic driving loop through the mountains to see the changing fall colors, but with the prediction that the Aspens are starting to peak, the Colorado road calls. And there’s no better way to enjoy this shift in the seasons than with a Colorado Brewery Days’ drive. Today, we’re combining our Tuesday and Thursday posts to highlight a scenic drive that will surely be worth taking in the next couple of weeks: the Aspen to Gunnison loop featured here on the website . . . The Central Mountains of Colorado are not necessarily the easiest to get to from the Front Range or the Western Slope. Once there though, you’re in the heart of the Rockies. This drive is wonderful during the spring and summer, but it’s our featured loop for seeing some of the most stunning fall colors in the state. Check with local tourist offices to be sure the trees are turning before you go. We also recommend making this a weekend camping trip and connecting it to your exploration of the breweries in the Arkansas River Headwaters area. From I70, jog south on 24 to the turn off for Independence Pass (West 82). As you travel over this beautiful pass, feast your eyes on the turning aspens. The world-renowned ski town of Aspen makes a great early lunch stop, and of course you’ll want to drop into Aspen Brewing Company along the main street. Read more about this drive! 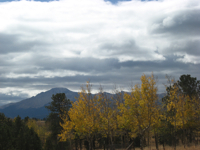 This entry was posted in Craft Beer Adventures and tagged Aspens, Aspens Turning, Colorado Fall Colors, Fall, Fall Colors, Scenic Driving in Colorado.